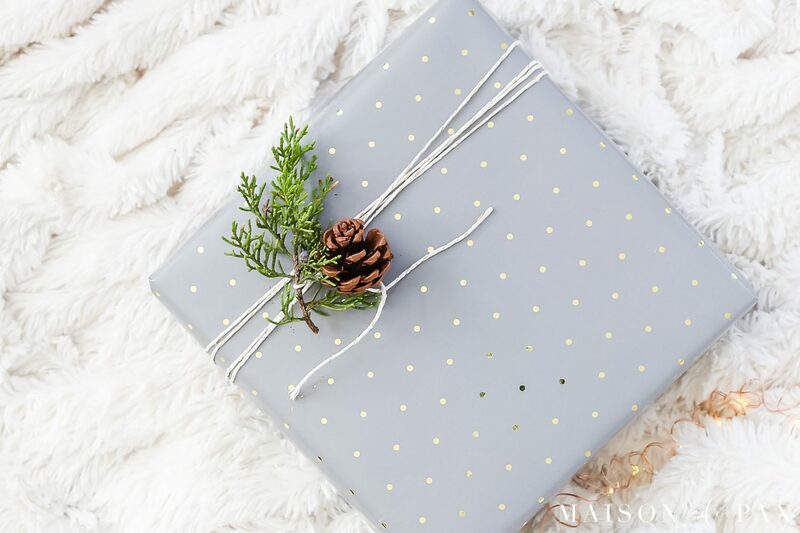 Looking for easy gift wrapping ideas? 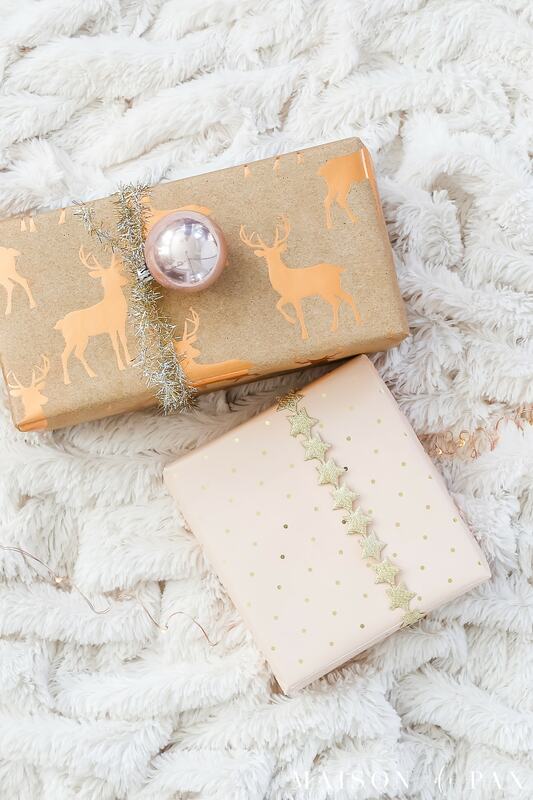 These simple ideas for holiday gift wrap will make your Christmas presents gorgeous in no time. I grew up with three brothers. At least 75% of gifts given to me while growing up were “wrapped” in a trash bag or grocery sack. The other 25% were just hidden behind their backs and brought out with a “voila!” Seriously. And while I’m not complaining (Lord love those boys! ), I like to present my gifts with a bit more finesse. 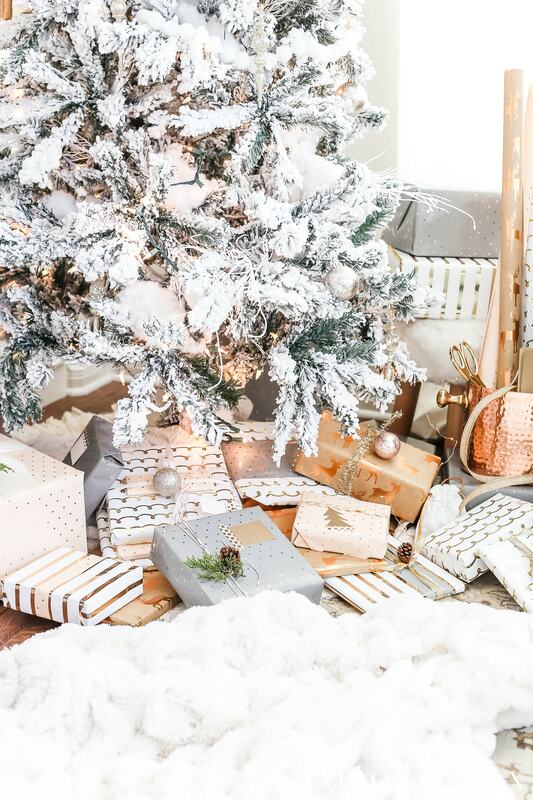 I even mentioned in my tips for simple, elegant holiday decor that wrapped presents should be treated as part of decorating your home for the holidays! But this lady doesn’t have time for intricate, complicated wrapping. This lady barely has time to take showers… super complicated wrapping (which, honestly, isn’t much appreciated by those brothers or my sons 😉 ) is just not in the cards. 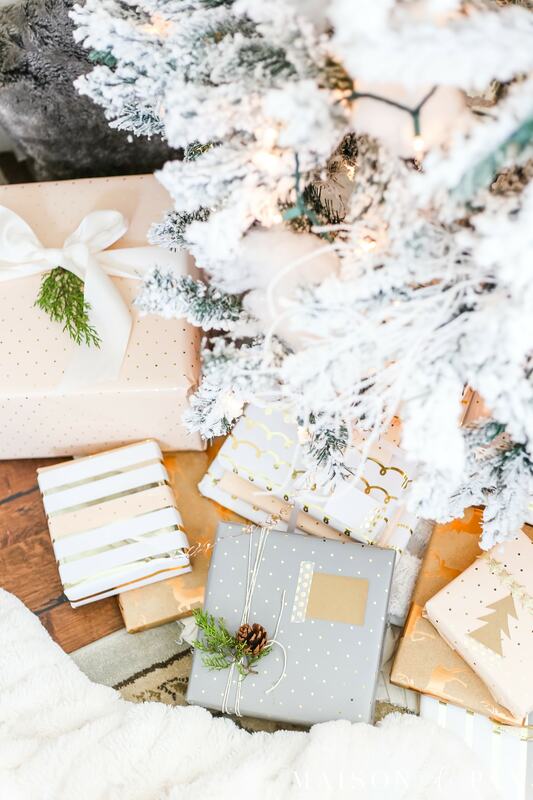 So I’m excited to share my tips for easy, beautiful wrapped gifts along with Krista from The Happy Housie today! 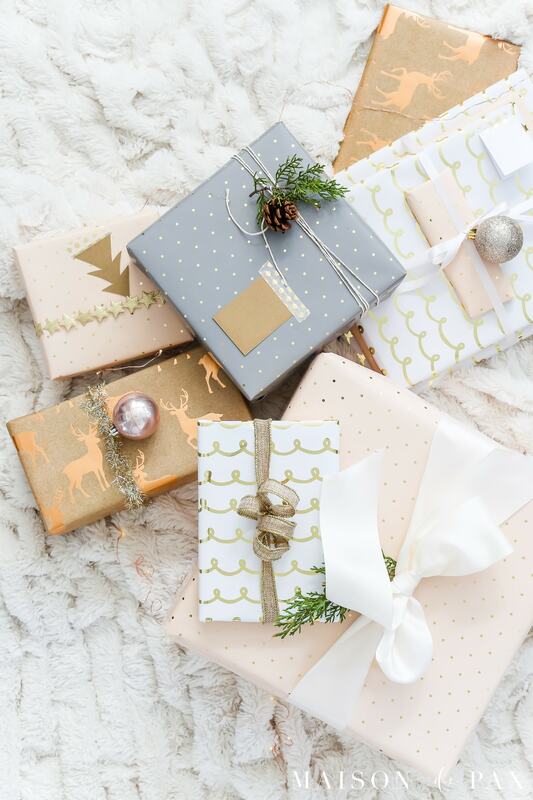 Be sure to catch all the other gift-wrap ideas at the end of this post. I generally buy 3-4 rolls each year that coordinate but don’t necessarily match. 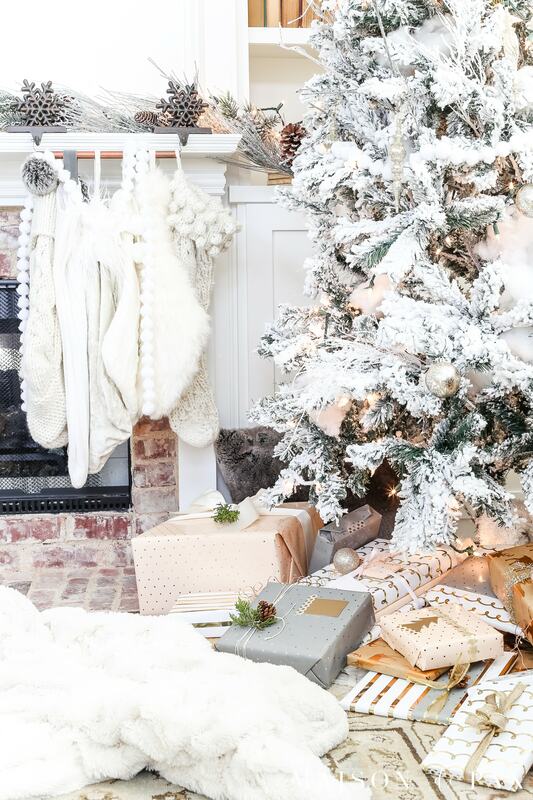 This year, I chose this soft pink, this classic gray, and this gold stripe. The gold curly cues and the reindeer were left from last year and happened to go perfectly! There are so often extra little scraps of paper than don’t fit a gift. Use it! I love to pick one general metallic (this year it was gold) and white, of course, and just pull out as many different types/sizes as I have. I might pick up one or two more if the price is good, and the combination under the tree is so fun. 4. Multi-wrap the baker’s twine. One of my favorite ribbons is baker’s twine. I bought a huge spool several years ago that has a little gold thread running through it (similar to this). It’s lasted me through so many gifts and projects (like our advent calendar this year)! For maximum impact, wrap it around several times. 5. Use big ribbon for big packages. I love the look of a giant satin bow. Get big rolls of this stuff at craft stores for cheap with a coupon (or here’s a pretty good price online, too) and just tie it on. 6. Add an ornament or pine cone. Fresh or faux clippings make all packages instantly cheerier. That coordinating paper will shine with a simple stacked bundle. They don’t have to be the exact same size or shape… the combo of papers is so much fun. 9. Cut tags from card stock. So so easy. Cut them any shape you want! 10. Use washi tape to secure tags. 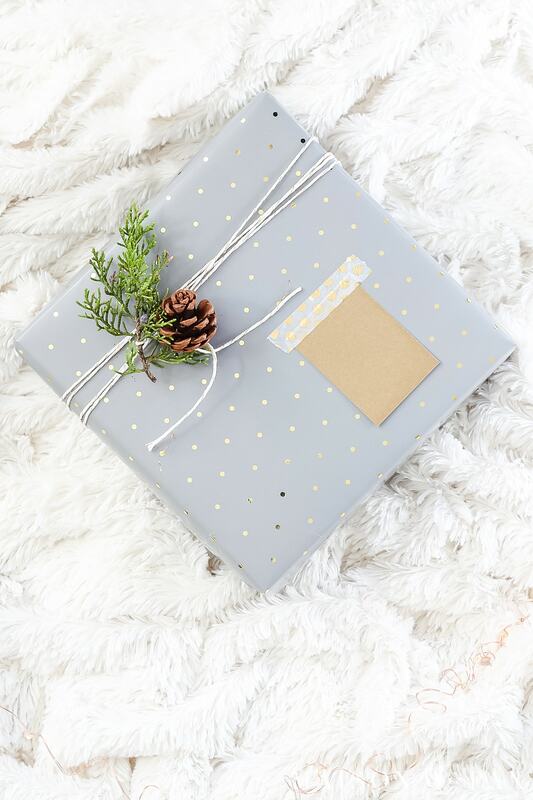 You can hole punch the card stock and tie it on with the ribbon or twine, too, but I love the simplicity of just sticking it on there with some cute washi tape. 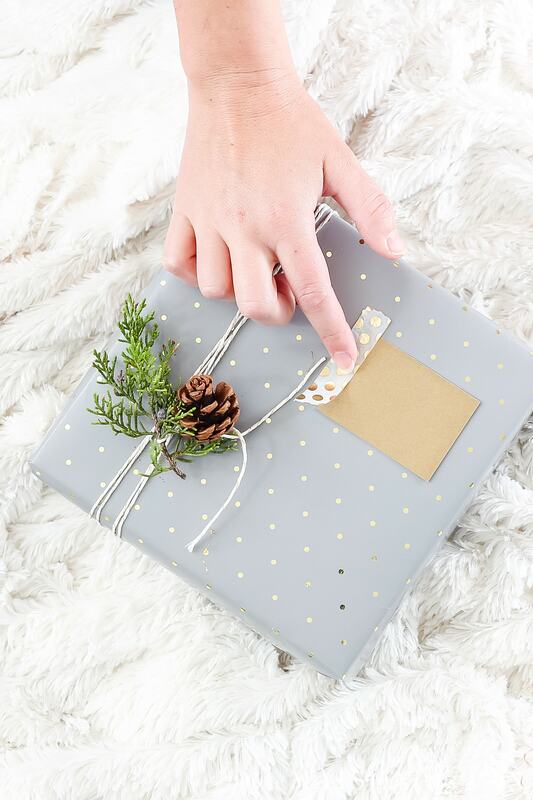 With these tips, you can create gorgeously wrapped gifts in no time! Assuming you’ve actually done your shopping, of course. 😉 . 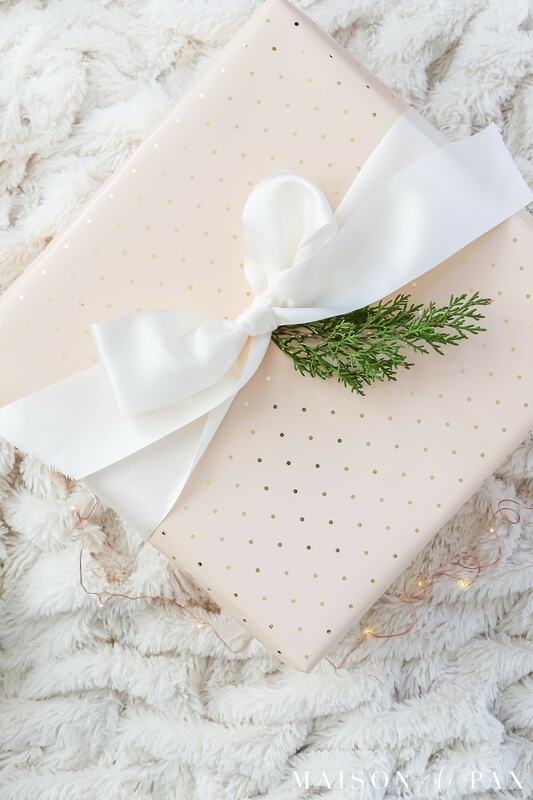 If you need more gift ideas, be sure to check out my shopping guides this year: for her, for kids, and for everyone else. Or pin it for whenever you’re ready. 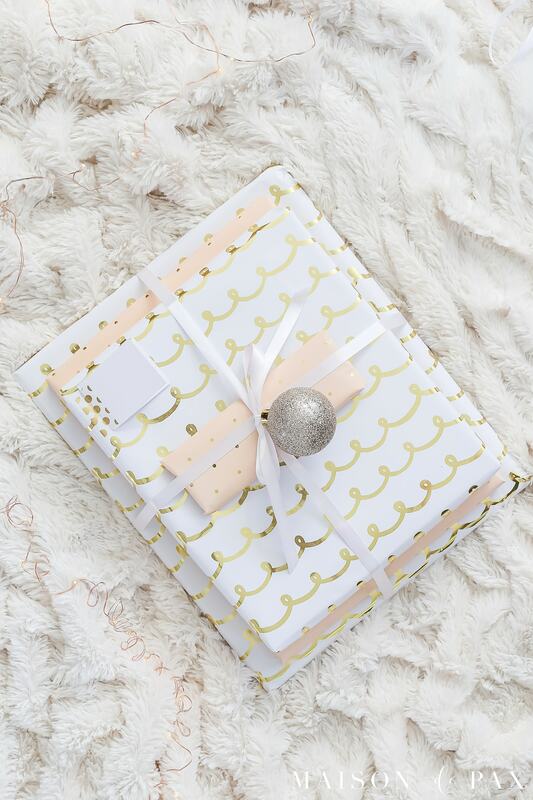 Now be sure to visit these other gals and their gorgeous gift wrap ideas! And happy gifting this year. 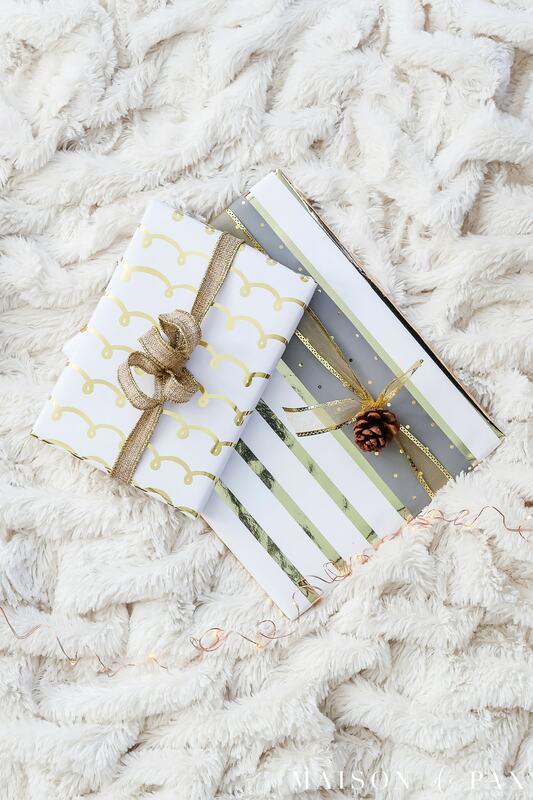 Absolutely gorgeous gift wrapping and fantastic tips, Rachel! Plus, I’m thinking of booking a flight to Texas so you can teach me in person your master-photography ways! Unbelievable imagery, friend! Thanks for joining in on this hop today! Such great tips, Rachel (I think I do all of these without even knowing it). Your paper selection is absolutely gorgeous. And your story about your brothers made my day 🙂 Happy Holidays! I’m so glad- my brothers shaped me in so many ways! Thanks for stopping by, Shauna. I LOVE this color scheme. And that deer paper!! So beautiful as always! Rachel everything is so classic and stunning! Simple and elegant is the way to go and you have inspired me! Merry Christmas! So glad it inspired you! Merry Christmas, friend! Washi tape is a fav of mine too – loved these tips! 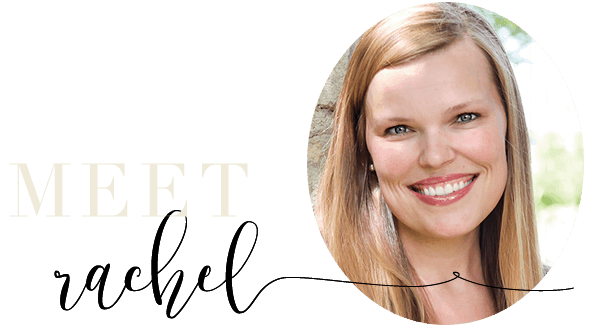 Hi Rachel… I love your blog! Do you have any tips on how to cut a straight strip of coordinating paper when you layer? I have a terrible time with getting straight edges on the smaller strip of paper. Thanks and have a wonderful Christmas! Thank you! And yes! I buy paper than has grid lines on the back. 😉 . The ones I linked to at Target have it, and it seems that many more papers these days are doing that. It’s the only way I can get straight edges myself!